In statistical terms the refugees that arrive in Arizona are indeed dwarfed in size by the influx of illegals that sneak across the border. FAIRUS and the Pew Hispanic Center estimate that Arizona has about 400,000 illegal aliens residing in the state. About a quarter of a million illegal aliens cross the Arizona border per year en route to other states. The refugee program causes many problems—among them is the distortion of the labor market caused by influxes of new workers that displace citizens. Refugees get immediate authorization to work upon arrival and they receive unrestricted Social Security cards. Refugees directly compete with U.S. citizens for all manner of jobs, both skilled and unskilled, high and low wage. After a few years refugees are typically granted an adjustment of status to legal permanent residency. They then become a permanent part of the U.S. workforce. Refugees are not subject to numerical limits on adjustments of status. State spending on refugee resettlement is an unfunded mandate because states have no say over accepting refugees but they are required to provide services for them. The federal government customarily rubber-stamps thousands of refugee applications that are submitted by private organizations. Decisions over which refugees to accept, and where they will be resettled, are often administered by nongovernmental agencies (NGOs). Many of the NGOs work closely with the United Nations (UN) and are not accountable to the American people or to federal agencies. The UN refers about one-third of the refugee admissions and the United States usually accepts about half of those. California has historically taken the largest share of refugees, but Illinois, Florida, Pennsylvania, Maryland and Virginia are also popular dumping grounds. Arizona takes more refugees per capita than any other state. Sometimes the President of the U.S. decrees that groups of refugees will be accepted by the states. A case in point: by January 2008 President Bush signed the Refugee Crisis in Iraq Act into law. Subsequently, in June 2008, President Bush signed into law a special immigrant visa program that allowed an increase of 5,000 Iraqis into the U.S. each year for the next five years. By September 2009 the United States had resettled 18,838 Iraqis during the 2009 fiscal year, an increase of almost 5,000 since the previous year. In April 2012 the State Department noted that during the first half of this fiscal year, 579 Special Immigrant Visas were issued for Iraqis. This compares to the 719 that were issued in all of 2011. Somebody (it’s anyone’s guess who) made an arbitrary decision that thousands of these Iraqi refugees were to be resettled in Arizona. Residents in Arizona were never asked if they wanted to welcome so many refugees into their state. It’s difficult to guess how President Obama will follow Bush’s legacy on Middle-Eastern refugees, but it seems logical to expect increasing numbers of them from Iraq and Afghanistan as U.S. troops are withdrawn, and it’s a sure bet that Syrians will be given refugee status. We won’t know how many of them are radical Muslims or which ones have sectarian ideologies until the damage has been done, and people have lost their lives. Besides the economic problems that refugees cause, there are more insidious societal problems caused by these foreign immigrants. All too often they are dumped into communities with only feeble assimilation programs to help them adapt to their new homeland. Proficiency in the English language is not a requirement for refugees, so attempts at socialization are very problematic. Of course many of them don’t want to assimilate, so language isn’t the only barrier involved. Few refugees and asylees are properly vetted to verify who they really are and confirm that they accept our cultural traditions and value systems. They come from cultures so diverse and alien from ours that all attempts at assimilating them are likely to prove futile. Four case histories provide anecdotal illustrations of the problems that refugee programs have caused in the state of Arizona. 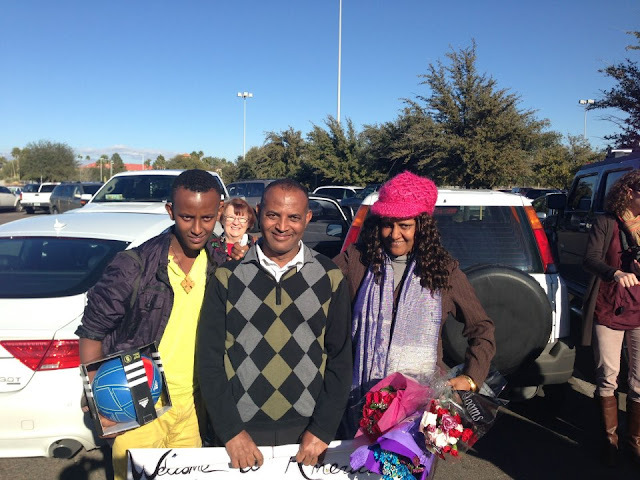 Similar stories have been repeated time and time again throughout the U.S.
Tilahun Liben, an Ethiopian refugee, was a political prisoner and his family suffered persecution. The International Rescue Committee arranged for him to get a refugee visa to live in Arizona. The IRC also helped Tilihun to file the paperwork to enable his family to obtain asylum visas so that they could join him in Tucson. The Liben case is a compelling humanitarian story, but the bottom line is that the State of Arizona and the Federal Government footed the bill to allow the Liben family to live and work in the United States. The Liben story seems to have had a happy ending, but it would be even better if the taxpayers who footed the bill had a say in whether to pay for the entire family to live off the public dole. It is not known if the Liben family is self- sufficient or is still receiving some type of welfare aid. Abdullatif Aldosary, an Iraqi refugee to the U.S, bombed a Social Security office in Casa Grande AZ early in December of 2012. The 47-year-old Iraqi refugee was arrested and put in federal custody. Abdullatif Aldosary is being held without bond and faces prison time and deportation. The news media insisted that his crime case had nothing to do with terrorism, but no rational explanation has been publicized as to why Abdullatif committed the crime. Several years before the bombing incident, Aldosary served eight months in prison for aggravated harassment of his employer. In addition, he was charged with aggravated assault in Casa Grande. After either one of these felonious crimes he should have been deported, but instead he was allowed to stay in the U.S. Aldosary seems to have no trouble obtaining dangerous chemicals and material for bomb making, or to move around Arizona wherever he pleased. Faleh Almaleki moved his family from Iraq to a suburb of Phoenix, Arizona, in the mid-1990s. They were part of the large contingent of Iraqis who were granted asylum visas by President George Bush the First purportedly so that they could escape persecution from Saddam Hussein. Many of the refugees were assigned to Arizona for their new home. Almaleki had a beautiful 17-year-old daughter named Noor. She had dreams of becoming a fashion model and probably could have succeeded, considering her exotic appearance. Almaleki was a Muslim traditionalist who demanded that Noor adhere to Sharia law. He became frustrated and bitter because he felt that Noor had been corrupted by a desire to live as a modern American woman. In other words, she dared to assimilate! Faleh demanded that Noor accept an arranged marriage in Iraq. According to court records, Noor refused to be married, and instead, she moved in with her 19-year-old boyfriend. She hoped to avoid her father’s abusive behavior, but he became further enraged when he found out that his daughter was living in an out-of-wedlock situation. In a premeditated act of violence, Faleh murdered his daughter to evoke what he considered to be an “honor killing” under Shariah law. Honor killings are an accepted practice in the Middle East against a female member of a family due to the belief that she has brought dishonor upon the family. Justification for these murders is usually caused by a suspicion that she dressed in a manner unacceptable to the family or community, or that she wanted to terminate or prevent an arranged marriage, or that she desired to marry someone of her own choice. Noor was considered guilty by her family on all three counts. Muslims commit over 90 percent of the honor killings worldwide. Faleh waited for the right moment to kill Noor. She was walking in a parking lot when her father slammed the gas pedal down on his weapon of choice—a pickup truck. He mowed down Noor and the mother of her boyfriend. Noor died two weeks after the savage attack, while Amal Khalaf survived after going through months of intensive care in the hospital. Faleh’s family and friends supported the honor killing. They became accomplices to the crime when they hid Faleh from the police. These familial co-conspirators helped Faleh escape to Mexico. In Mexico he boarded an airplane going to London in order to evade U.S. law enforcement. British authorities caught up with Faleh in London and arrested him before his planned exit to Iraq. No charges were ever filed against family and friends who conspired to hide Faleh and to help him escape to Iraq. Faleh’s exit to Mexico says a lot about the quality of our border security. If it wasn’t for British police, he would have made it to a safe haven in Iraq. And note the irony that Faleh wanted to escape to a country where he had claimed he was in danger of persecution. Apparently whatever fate he would face in the hands of his countrymen wasn’t as bad as imprisonment in the United States! Faleh showed no remorse for the cold-blooded killing and neither did his family. They believed that misogynous Sharia laws took precedence over the laws of the U.S., despite their vows to honor and obey our laws and Constitution when they took the oath of citizenship. Faleh faced the first degree murder charges and the death penalty for his crime, but got off relatively easy with second degree murder, aggravated assault, and two counts of leaving the scene of an accident. Somehow he and his lawyers convinced the jury that the killing was an act of passion, not premeditated murder. For someone to say this crime was committed to restore someone’s honor, they really do not understand what religion is all about. Noor Almaleki was the first case in the U.S. where a father who murdered his daughter was successfully prosecuted as an “honor killing. The light second degree murder conviction revealed a disturbing tolerance by the judge and jury considering the brutality of the attack. It’s a scary example of Sharia law in action and how it is in effect being incorporated into the U.S.—and how readily it is being accepted by a clueless American public. Faleh’s statement that tribal societies “can’t change” is profound and should be used as a stern warning for immigration-friendly Americans who naively believe that aliens will necessarily adopt American values. These four Arizona cases are not isolated stories. There are hundreds of similar examples from other locales. Although this article deals specifically with refugees, there is nothing special about this class of immigrants except that there is supposed to be proper vetting to test their loyalty to the U.S.
We should expect many more of these types of cases to arise as the immigration invasion continues, and as more aliens are allowed into the U.S. who have cultural values antithetical to ours. Most of them will refuse to accept our traditional Western ethics, so the only other alternative is a cultural collision that will result in our acceptance and toleration of their behavioral norms. Folks, it ain’t gonna be pretty! Rob Sanchez (email him) is a Senior Writing Fellow for Californians for Population Stabilization and author of the "Job Destruction Newsletter". To make a tax-deductible donation to Rob Sanchez, click here. This article is adapted from Refugee Problems in Arizona, published in the Summer 2013 issue of The Social Contract magazine.